Experience the excitement, energy, and attitude of the Nerf brand, and find out why It's Nerf or Nothin'. Nerf N-Strike Elite blasters from Hasbro deliver the ultimate in blaster performance for your Nerf blaster battles, with upgraded distance and the revolutionary Elite dart. Take aim with the Nerf N-Strike Elite Demolisher 2-in-1 blaster and unleash motorized dart blasting and pump-fire missiles! The N-Strike Elite Demolisher 2-in-1 blaster from Nerf fires both Elite darts and Nerf missiles to demolish the competition with two kinds of firepower. Get in the game and plan your battle strategy to optimize your attack and fortify your defense. Blast the 2 big Nerf missiles for maximum impact with pump-fire action. Unleash a powerful barrage of 10 Elite darts with motorized dart blasting. Or fire the missiles and the darts at the same time to sweep the field! Load the 10 Elite darts into the orange banana clip, and load 1 Nerf missile into the missile launcher barrel. Press and hold the acceleration trigger to power up the motor, then pull the launch trigger to fire a dart. The motorized Nerf blaster fires the darts an Elite distance of up to 90 feet! Time to add a missile to the mix? Then slide the pump handle forward and back to send a missile flying through the air. 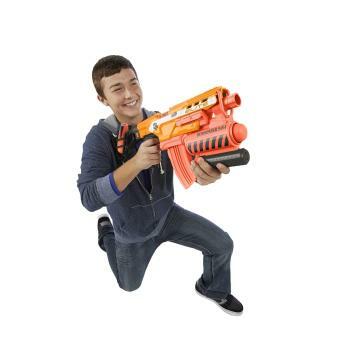 The orange Nerf 2-in-1 blaster has a removable stock so you can customize the blaster. The stock has an integrated storage area to hold 1 missile. The banana clip holds 10 darts to give you plenty of firepower for your Nerf battles. With the Nerf N-Strike Demolisher 2-in1 blaster, you can demolish the competition with a double whammy of Nerf darts and missiles! Blaster, stock, 2 missiles, clip with 10 Elite darts, and instructions.